When your Turtle starts to show interest in the potty, now is your moment to introduce Pull-Ups®. Your Turtle is likely to be hesitant and skeptical of the process, so he needs you to make Pull-Ups available and comfortable before he will want to use them. Make Pull-Ups a part of the bathroom environment and let him play with them a bit before expecting your Turtle to wear them. Turtles are concerned with consistency and predictability, so seeing Pull-Ups around all the time will help ease the transition to potty training. Turtles may be interested, but they want to do things their way and feel comfortable enough to know that their pace is OK. Present Pull-Ups in a way that gives them time to explore and gain confidence, but be aware that Turtles might also want some privacy while exploring. “I notice that you’ve been hiding behind the couch (in a corner, etc.) to poop. It’s great that you’re beginning to feel that your body is telling you when you have to go. That lets me know you’re ready for Pull-Ups. I put them in the bathroom next to your potty/the toilet so you can see and play with them. Now you have your own special potty training pants. Let me know when you’re ready for me to show you how they work. “Pull-Ups slide on and off. When you’re ready, you can wear them instead of a diaper, and when you feel like you have to go to the bathroom, you’ll be in charge. You can make the potty your special place to put your pee and poop. Would you like to try them on now"
If your Turtle is not ready to put them on, don’t push it; work together to find a special place for the Pull-Ups. “Your Pull-Ups will be right here. Maybe you will be ready to put one on after we change you next time.” Remember that patience is the key to a Turtle’s success. You won’t be able to rush the process; it’s better to work on routines and comfort level with each step of the process. Your Turtle is likely to be sensitive to sensorial change, so he may already be telling you right away when he has pooped or peed in his diaper and needs a change. You can use the different types of Pull-Ups — Pull-Ups® Learning Designs® and Pull-Ups® Cool & Learn® — to support this process and keep your Turtle where he wants to be: in control. Pull-Ups® Cool & Learn® provide a brief cooling sensation when your Turtle wets to help you teach them the signs of when they need to go. 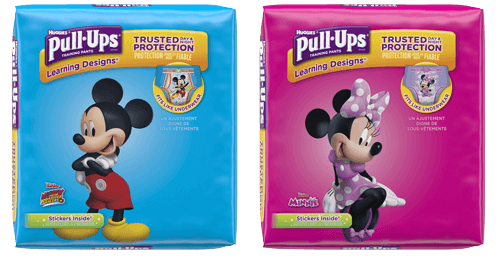 Pull-Ups® Learning Designs® allow your child to check the outside of their training pant if they aren’t sure whether they have already peed. If the design is faded, they know they have gone already. This helps your Turtle feel more in touch with his body’s signals, which will reinforce the whole process. These experiences, repeated over time, allow your child to connect the inner feelings before elimination to the feeling of elimination, and the feeling after elimination. This awareness is essential to the potty training process, and Pull-Ups help your child connect the dots to potty training success. After I'm done, I use the toilet paper to wipe, wipe, wipe. Potty training is a big moment — it’s when your little one becomes a Big Kid. So it’s important to reinforce this change, and there are a couple easy ways to do so. First, be consistent. When you take your kid out of diapers, keep her out of diapers. Pull-Ups are more than a training pant. They’re also a symbol to your little one that it’s time to potty like a Big Kid. Going back and forth from diapers to pants only confuses her. Next, make the first time she pulls on a pair of Pull-Ups a symbol — a promise that you’re in it together and will work and learn together on your potty training journey.